I actually had a simple ombre look in mind with the n*de paint you can spy in the middle. But as usual with me the layers keep on adding, the bling keeps on coming and the rest you can see for yourself. I like the end result though and how the textures and colors play well with each other. The n*de paint is from a set of 3 paints from Etude house, the green glitter is China Glaze This is Tree-mendous and the mint color is Sally Hansen Sugar Coat in Sour Apple. The overall effect is simple to create. You just need to dab the glitter on keeping in concentrated on the tips and more sparse as you progress towards the base. The outcome is all dependent on your skill and patience 😀 I so love the green glitter paint! It was part of their LE collection and I was tearing my hair out trying to find how I could get my hands on it. And waddya know!!! I found it in the most unlikely place….kkcenterhk! They even have some bloody fine Essie paints so go and check them out. With that I bid you adieu…Do let me know what you think of this attempt of mine. And please do check out my youtube channel if you still haven’t. Kindly do subscribe to it so that you can get an alert as and when I put a new vid up. See you dolls later! 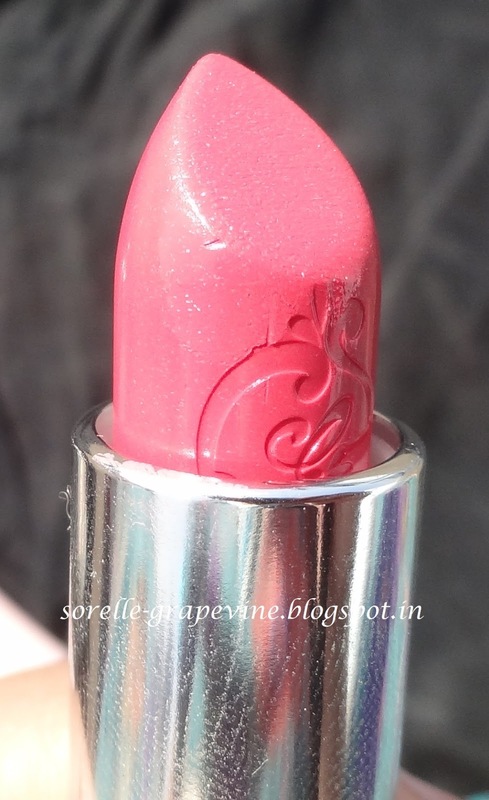 Today I’m back with another lippy from the Etude house Princess Etoinette collection. I must say that I’m in love with these especially the gorgeous girly packing. There is a heart blusher in this collection that is still evading me for now but I will get my hands on it hopefully soon. That is the cutest thing ever! I’m not going into detail about the packing again. If you are new reader please read my previous review on one of the other shades I had both from this collection HERE. I will hop on directly to the product itself. The product is odorless and the texture is very smooth and slightly creamy. 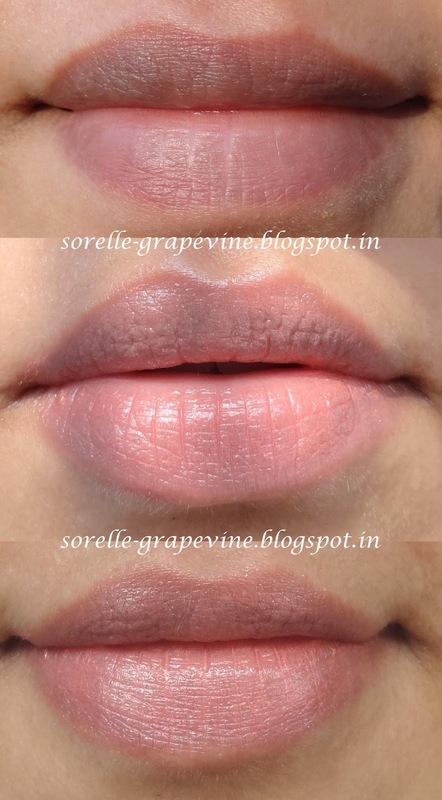 It glides on lightly on the lips and imparts a decent amount of moisturization. It does not sit heavily on the lips nor does it highlight any imperfection. It tranfers easily due to its texture and by the third time I blotted it the color looked more like a light stain on the lips. The color is an “earthy” pink which is to say it is a brown toned pink and has minute silver glitter particles in it. The silver is sort of more prominent on the lips than it looks in the hand swatch but it is not OTT. 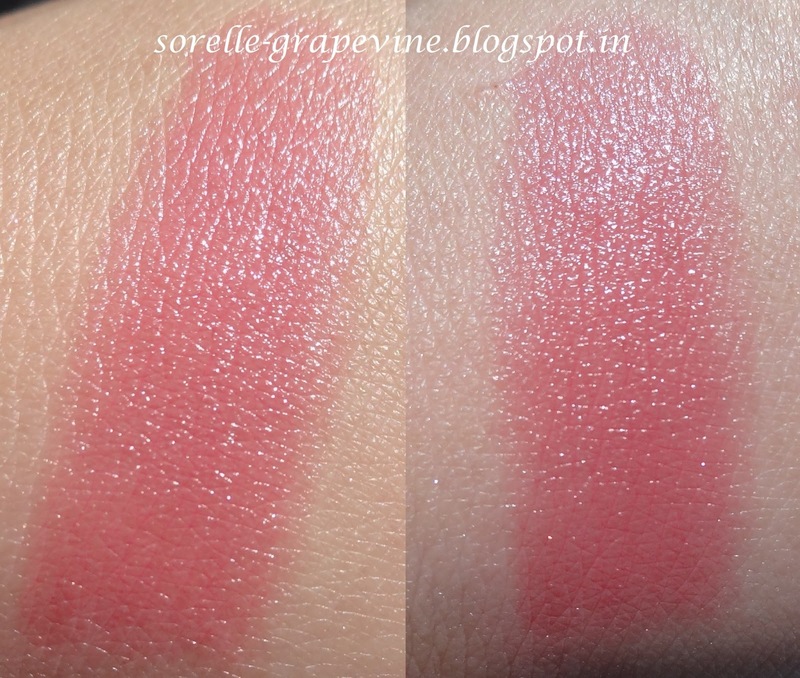 The pigmentation is not intense but kind of like MAC lustre lipsticks. 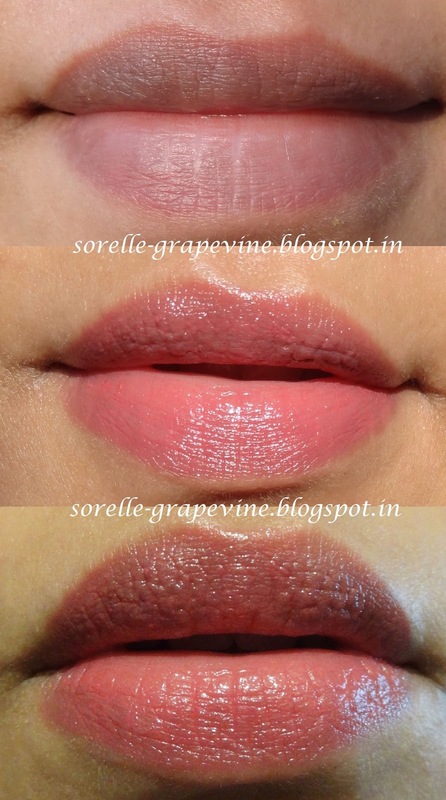 The color can be built upon but by no means will it completely cover the pigmentation of your lips. Due to its lesser color intensity it can be worn easily in the day time. A nice subtle color in which the glitter helps to add dimensions. Price is $16.98 (approx Rs. 917/-). Short and sweet review covering another item from the Princess Etoinette collection. Did any of you purchase anything from this collection? Do you feel it is worth the price tag? Write in with your comments and suggestions. Have a wonderful weekend! Take care. 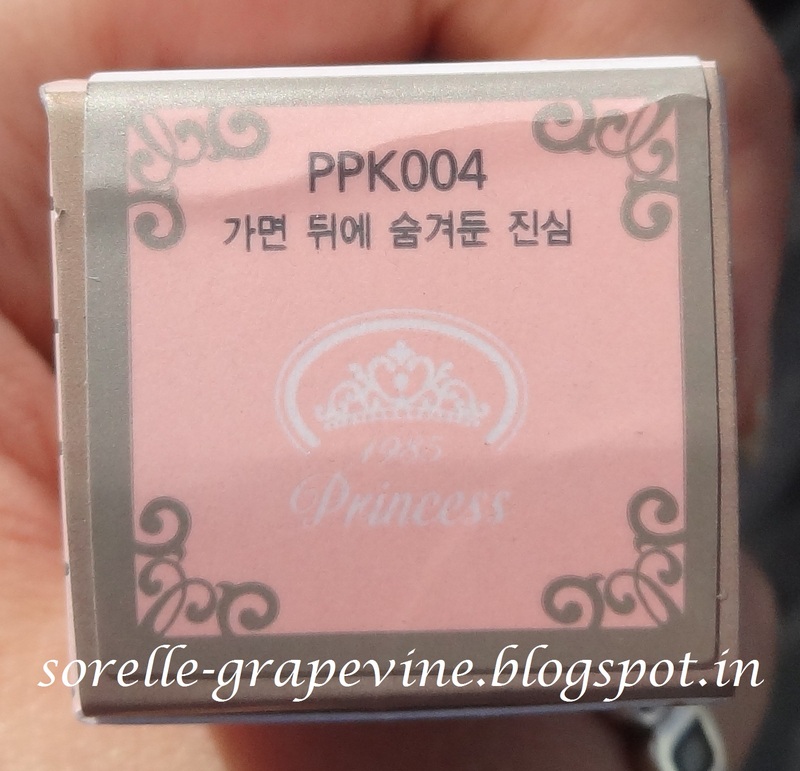 Would you purchase Etude Princess Etoinette Crystal Shine Lips PPK004 again? – Not this color but something else I would like to try out. 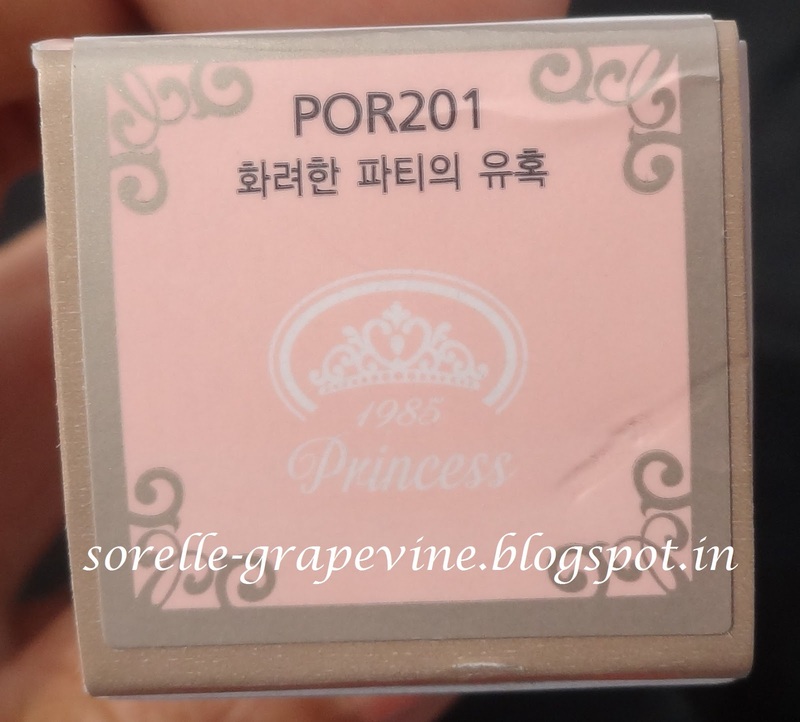 Would you recommend Etude Princess Etoinette Crystal Shine Lips PPK004 to your friends? – For the given price tag there is nothing exceptional about it so no. But for the packing, seeing that it is LE and for the other shades part of the collection yes I would. Hello my pretties! Do you remember those days when we would dream of a story like Cinderella? Wearing a ball gown, twirling on the floor and a handsome prince waiting for us in the end. All the romantic ideas those lovely stories brought in. Feeling like a princess waiting to be whisked away by the prince atop a white horse…..Ahh those innocent days :). 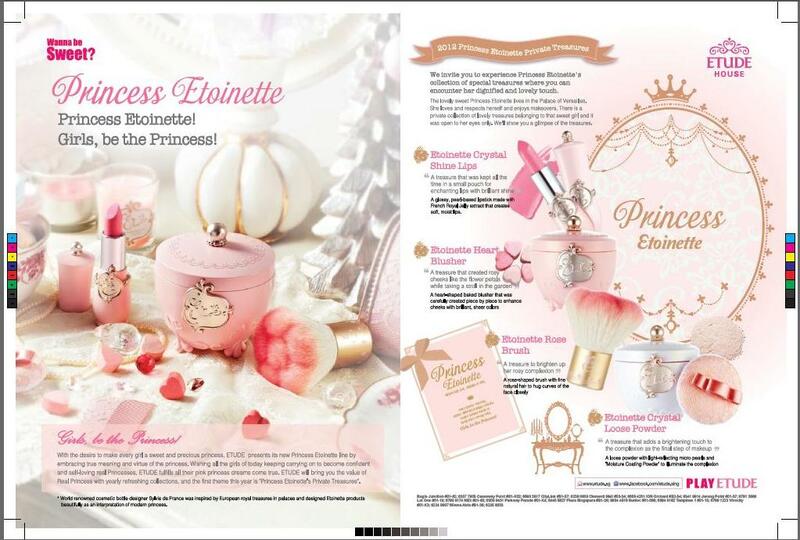 To capture that beautiful spirit Etude recently launched the Princess Etoinette collection. Oh boy! Oh Boy! Oh Boy! Can I just say……..LOVE!!!! Well they take us to France to be a famous (or rather infamous) French queen. I think they adopted Marie Antoinette and gave it an Etude twist thus giving birth to the Princess Etoinette collection. Queen/Princess who cares right. Gotta love the French! The opulence and elegance has been captured in its beautiful packing. Just the packing is cause enough to buy these beauties (actually one of the biggest or rather THE reason that I got them). They even took the pains to get a French company to design this gorgeous packing. See this is how they do it in France!! Are the wanna-be “French” companies listening. Any hoo moving on. I got the Crystal Shine Lips lipstick in the shades PPK004 and POR201. I will cover PPK004 in a separate post. Lets talk about the POR201. The box is light pink in color with silver detailing. The tube is in the same light pink color with the detailing on it done in pinkish silver. There is braiding design all around and a lovely crest design in the middle representing the house of Etude. If you twist out the lipstick completely you will see the same crest design on the lipstick itself. Pretty right.?!? Coming to the product. The texture is really smooth and moisturizing. 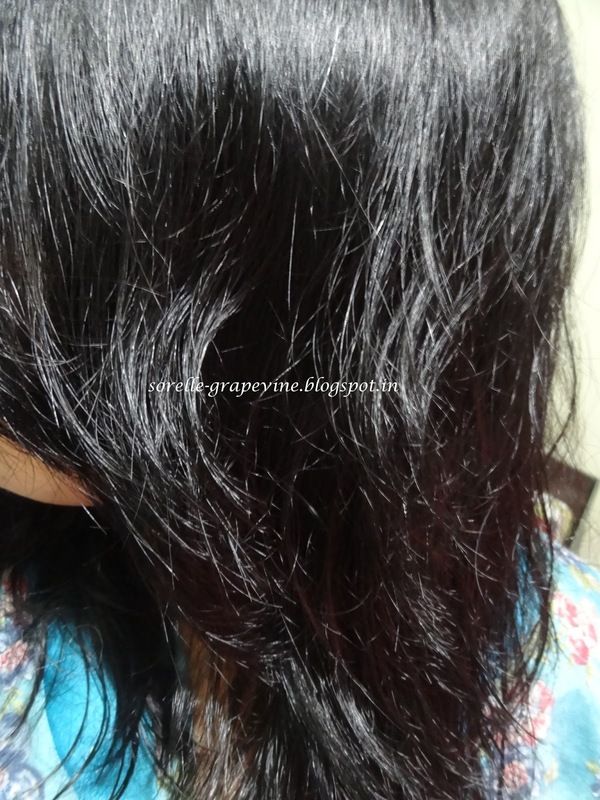 The color is sort of sheer and the pigmentation is a little light. But it can be build upon to an extent. Etude says that this lipstick will impart a soft shimmering flush which it does. It looks natural. Color is soft peach with minute gold particles which you cant really see but they help to add dimension to it. Prefect for day wear. I feel that it will suit most light to medium tones. For dark skin this might look too pale and washed out. Just a thought. Well it is a little pricey. But given that it is LE and that too with such pretty packing I guess the price is expected. It is priced at $16.98 (approx Rs. 917/-). 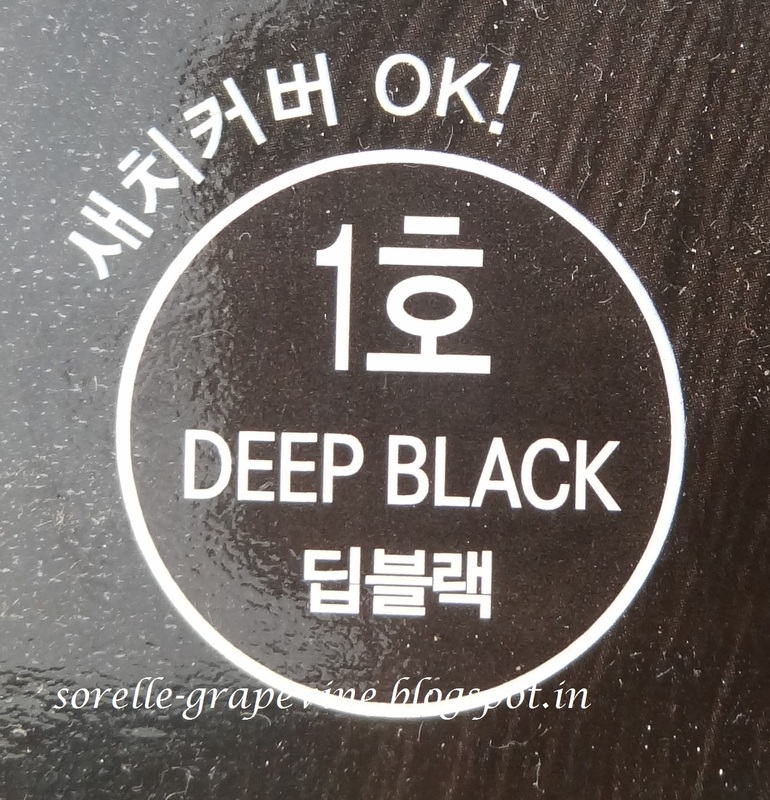 I bought it from the Cosmetic Love shop which I have reviewed HERE. Check out the other items present in this collection. They have makeup brush set which is in a pretty pink case covered in lace. Cosmetic love does not have the complete collection with them though. They are missing this heart blusher set which is too cute for words!! I hope they include it soon. So that concludes this review. What did you gals think about it? Does it appeal to the princess in you?? Write in and let me know your thoughts and views. Until next time! 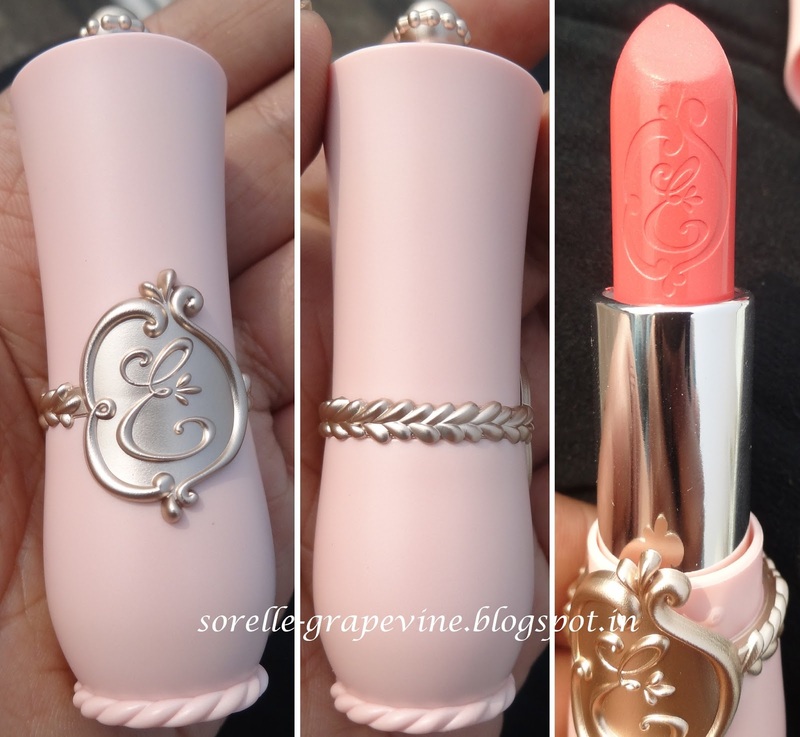 Would you purchase Etude Princess Etoinette Crystal Shine Lips again? – They have 8 colors in total and I have bought 2. I just might check out some of the others. 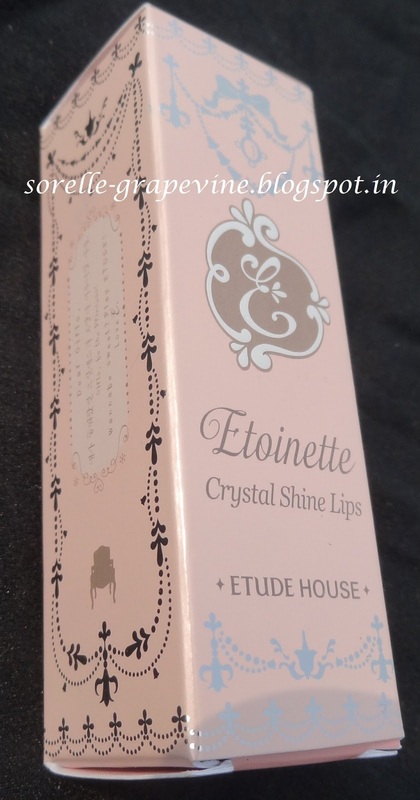 Would you recommend Etude Princess Etoinette Crystal Shine Lips to your friend? – Yes I would. Good morning!! Hope you guys have a good Sunday :). 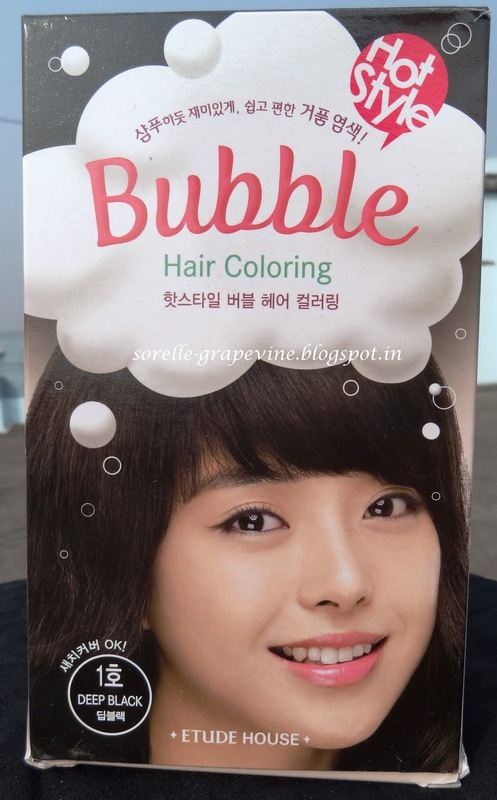 Today I bring to you a novel concept from Korea – bubble hair coloring. Sounds exciting no….There is something about bubbles that reminds you of childhood. Well let’s see how this product works and what it did for me. The pack contains a 2 solutions – one is in a baggie and another in a dispenser bottle named 1 & 2 respectively. Apart from this you get a Silky Treatment which is basically the after color conditioner, a set of gloves and something I liked a plastic sheet which you could drape on your shoulders sort of like the small ones you often see in the salons. They include a pamphlet in the pack but it is in Korean so no help there. They do however have some instructions in English on the side of the box. Ok so it was not clear on the box if your hair should be dry or wet before you use this so I choose it to be dry. Remember like most hair colors you do not put it on freshly shampooed hair. Wait for a day or two before coloring. Now you put the solution 1 into the bottle ie is 2 and shake it to mix. 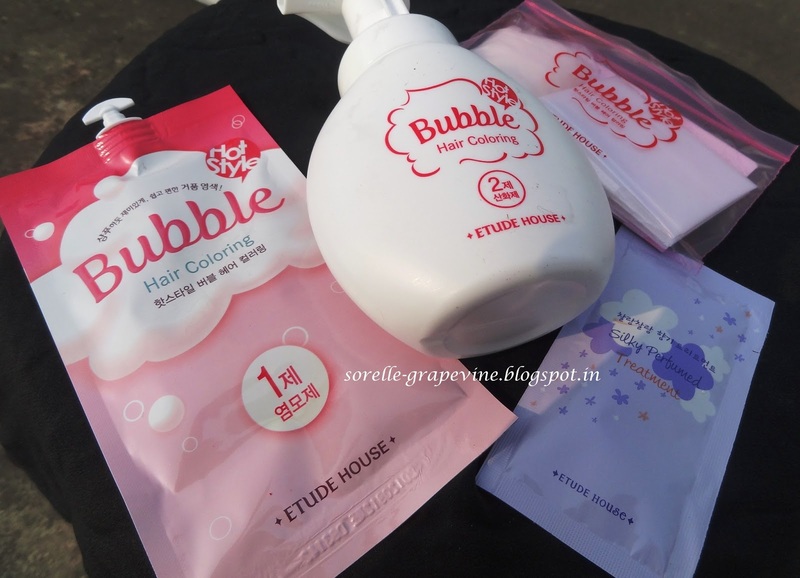 Then using the pump you dispense out the bubbles on your palm and then spread it evenly on your hair. There was very little solution in both the packs but when mixed together there was a whole lot of bubbles. I mean me and my mom both used it and there was still a bit left. Not that either me or my mom has a lot of hair you know but I still think that 2 people with medium length hair can use it at once. When we share the usual color kits mom is able to cover all her hair and I just get some to do my crown area. At first it seemed like nothing was happening but adding layer upon layer of product the bubbles started building and covering the scalp and their color was getting oxidzed. 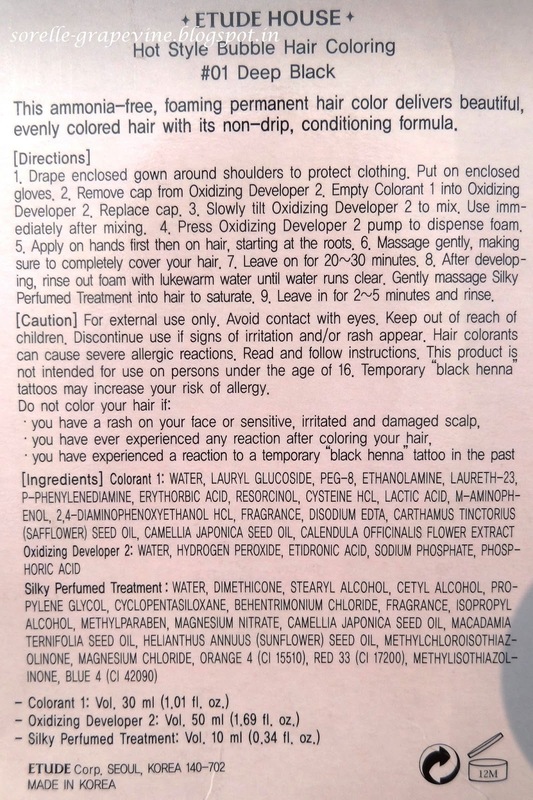 There was no ammonia smell which is expected as it is supposed to be an ammonia free product plus there was no other smell as well. The areas of the skin which got a little color were easy to clean off with some water with no staining left behind. After 30 minutes of use it was time to wash it out with some plain water. Now came the treatment which was supposed to be left in for 2-5 minutes. Voila! Soft and nicely colored hair :). My mom found it a little drying but it felt fine to me. In fact I felt that it left my hair quite soft. All the grey was properly covered and I saw some shine in my hair. All in all it was really a fuss free simple way to color hair. I didn’t have to put in too much effort rather I didn’t do anything to part my hair and then cover sections individually. I just put it on both for me and mom like using shampoo. 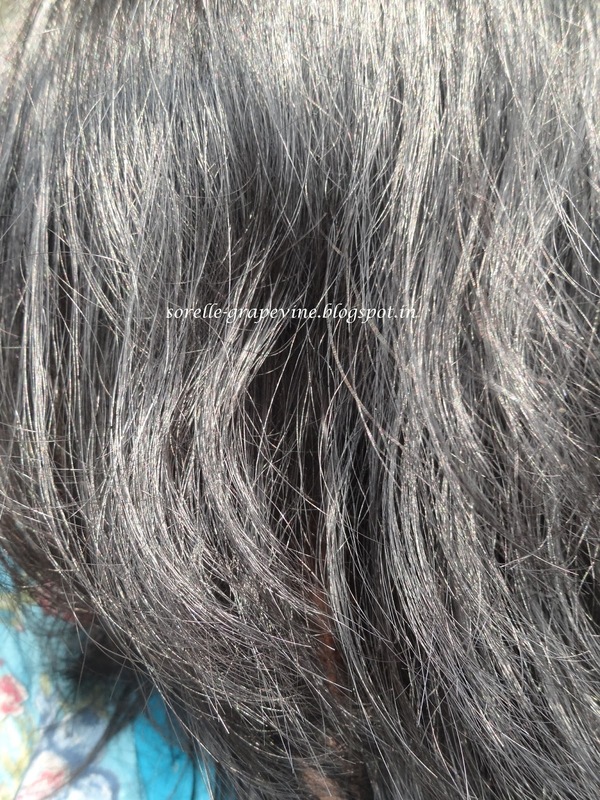 The texture of the product did all the work and covered all the hair evenly and properly. It was much faster than the usual do-it-yourself coloring kit. Hope you all liked the review. Please do leave your comments and suggestions below. Have a fab day! Take care. Would you purchase it again? – Yes I would. Would you recommend it to your friend? – Yes.